(WBIR - CLAIBORNE COUNTY) Four people have been charged in connection with the death of a Clairfield man. Hershel Gulley, 56, was found dead in his yard last Friday. Investigators believe he had been beaten, but an exact cause of death has not been determined. UPDATE: WEDNESDAY, JULY 1, 2015: A new sign has been posted at Amyx Hardware & Roofing Supplies in Grainger County. The sign reads, "We reserve the right to refuse service to anyone who would violate our rights of freedom of speech & freedom of religion." The sign bears the signature of the store's owner Jeff Amyx. We'll have more on this story later today on 10News and WBIR.com. 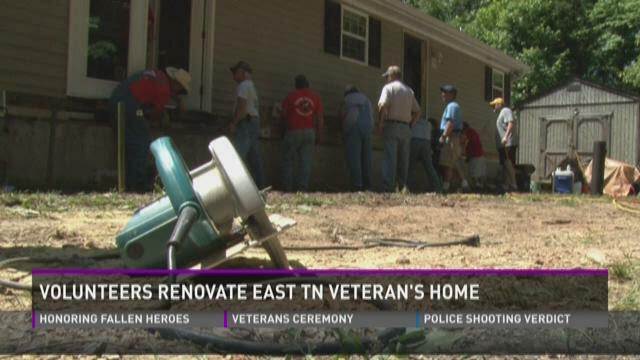 (WBIR- Union County) Volunteers from several states gathered in Union County this weekend to renovate a veteran's home after he had his leg amputated. A fire destroyed one of the few historic landmarks in Sharps Chapel early Friday morning. More than 50 percent of the two-story wooden building was ablaze when crews from the Sharps Chapel Volunteer Fire Department arrived at the scene on 105 Dr. Davis Road shortly before 2 a.m. Firefighters spent more than three hours battling the fire, which burned down the home. Animal shelters across the southeast are stepping in to help more than 100 dogs rescued in Union County. The dogs were seized from what shelter workers called a hoarding situation last week, and taken to the Union County Humane Society, where workers cleaned them up and gave them medical checks. They are hoping to get them ready for adoption.